Persistence Market Research (PMR) delivers an all-inclusive analysis on the global food ingredients market, in its new report titled “Food Ingredients Market: Global Industry Analysis (2012-2016) and Forecast (2017-2022)”. PMR’s report compiles the qualitative and quantitative forecast by industrial analysts, information on market players around the value chain, and first-hand data acquired from industry experts. The information issued in the report is exhaustive, propounding an in-depth prognosis on growth of the global market for food ingredients for the forecast period – 2017 to 2022. The report has analyzed macroeconomic indicators, governing factors, and trends affecting expansion of the global food ingredients market in detail. The report has employed an intensity map for portraying the presence of key participants contributing to the market growth. Data regarding global revenues procured from sales of food ingredients during 2012 to 2016 is collected for coming up with a historical baseline. The data gathered has then been utilized for the development of presumptive scenarios concerning immediate future projections on the global food ingredients market. The first chapter of the report offers the executive summary of global food ingredients market, providing forecast on the market across key all the regional segments included. The market size projections offered for the forecast period, coupled with the compound annual growth rate of the global food ingredients market is offered in this chapter of the report. A chapter on overview of the market follows the executive summary, delivering the market introduction along with the definition of – food ingredients. The overview also delivers information on current as well as future dynamics of the global food ingredients market, including factors influencing the market expansion of food ingredients. This chapter also includes analysis on cost structure, value chain, trade, pricing, and distribution network. The report also provides study on presence of leading market players by plotting them across key regional segments. The report’s succeeding chapters deliver forecast on the global food ingredients market based on a segmentation-wise analysis. The global market for food ingredients has been categorized into four key segments viz. function, application type, product type, and region. Region-wise the market has been primarily divided into six key regions, which are Asia-Pacific excluding Japan (APEJ), Europe, North America, Latin America, Japan, and Middle East & Africa (MEA). The report’s concluding chapter focus on the competitive landscape of the global food ingredients market, offering a comprehensive analysis on current and future market conditions of key players. In addition, the report has offered key insights on the market players based on SWOT analysis, key developments, key financials, company overview, and product overview for the forecast period. Analysts at Persistence Market Research (PMR) adhere to a robust research methodology to deduce data about the market size. PMR’s analysts have followed a demand-side approach, with an aim of estimating the sales of targeted products. They have also followed an in-depth supply-side approach on the basis of events, prevailing trends, and value generated for the forecast period. For interpreting the global food ingredients market’s forecast values, projections across metrics including absolute $ opportunities, compound annual growth rates, basis point share index, and year-on-year growth rates have been delivered in the report. The market numbers issued in the report are universalized into “US$”. Scope of PMR’s report on the global food ingredients market is to enable players in formulating key strategies for intensifying their presence in the market over the upcoming years. Food ingredients are additives for performing various functions in food, such as maintaining or improving freshness & safety, nutritional value, taste, texture and appearance. Various types of food ingredients include starches, vegetable oils & fats, natural sweeteners, enzymes & antioxidants, natural flavorings & colors, and functional ingredients. Globalization is making the world a smaller place to thrive in, with increasing trade activities across various sectors, which does not exclude the food & beverage industry. This has resulted into a rampant rise in export & import of food ingredients globally, for maintaining the quality and enhancing the shelf-life of food products. Rapid urbanisation, and soaring population density with their increasing purchasing power has led towards rapid adoption of convenience food, thereby leading towards demand for various food ingredients. With the rise in food borne diseases, the consumers are becoming more health conscious and demanding for natural food ingredients. The number of women workforce has witnessed a tremendous surge over the past decade, which in turn has propelled demand for ready-to-eat foods. Leading manufacturers in the global food ingredients market are focusing on new product development. However, stringent government regulations, coupled with the time consuming process of approval prior to the commercial launch of products are pressurizing manufacturers in obtaining approvals before distribution process. In its recent research report, Persistence Market Research (PMR) has projected the global food ingredients market to register an impressive expansion throughout the forecast period, 2017 to 2022. The global food ingredients market is estimated to exceed US$ 400,000 Mn in revenues by 2022-end. 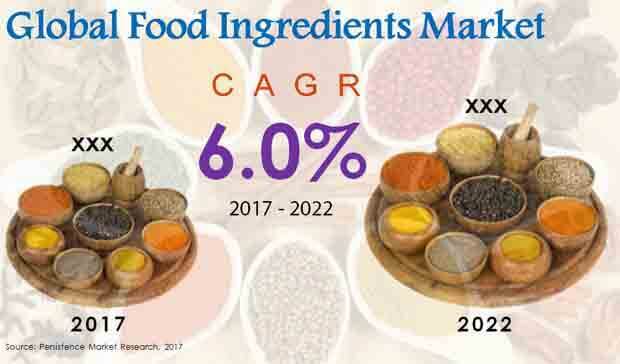 The food ingredients market is projected to exhibit the fastest expansion in North America, followed Asia-Pacific excluding Japan (APEJ), through 2022. Growth of the food ingredients market in Japan will remain steady through 2022. The market in Japan will exceed US$ 13,500 Mn in revenues by 2022-end. The market in Europe will register a lower CAGR than that in Japan, however it will account for comparatively larger revenues by 2022-end. Middle East and Africa (MEA) will register a relatively slower expansion in the global food ingredients market through 2022. In terms of revenues, starches will continue to dominate the global food ingredients market, based on product type. However, sales of functional ingredients, enzymes & antioxidants, and natural flavorings & colors are projected to register a relatively faster expansion in the market through 2022. Vegetable oils & fats will also remain a lucrative product segment in the global food ingredients market, with sales estimated to exceed US$ 100,000 Mn in revenues by 2022-end. On the basis of application, although sales of food ingredients in functional foods will account for the smallest revenue share of the market, their sales are projected to register the highest CAGR through 2022. In contrast, sales of food ingredients in frozen foods will exhibit the lowest CAGR in the market through 2022. In addition, sales of food ingredients in ready-to-eat foods and meat will reflect nearly similar CAGRs through 2022. However, revenues from ready-to-eat foods segment will remain comparatively higher than that of meat during the forecast period. Based on function, stabilizers, thickeners, binders, & texturizers, and emulsifiers segments are projected to exhibit similar CAGRs through 2022. Nutrients are anticipated to emerge as the fastest expanding function of food ingredients over the forecast period. This growth of nutrients is mainly because of increasing demand for nutrient-rich food products from health-conscious consumers across the globe. Although sweeteners will account for the largest market revenue share, sales of food ingredients in nutrients will witness a sluggish expansion through 2022. Persistence Market Research (PMR) has included key players contributing to the market expansion, which include AngelYeast Co., Ltd., Archer Daniels Midland Company, Arla Foods amba, Associated Milk Producers, Inc., Bunge Limited, Cargill, Inc., Fonterra Co-operative Group Limited, Givaudan SA, Glanbia Plc, Ingredion Incorporated, Kerry Group Plc, and Koninklijke DSM N.V.